Each radio is approximately 8-7/8 inches / 225 mm wide. The dials say "WLW" alongside the 70 (for 700 kc.) mark. 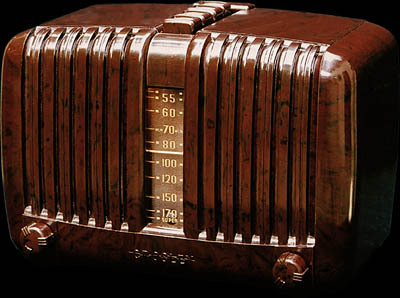 WLW was the Crosley-owned clear-channel station in Cincinnati. Back in the good old days, clear-channel stations had exactly that—a clear channel. No other stations were assigned those frequencies, so clear-channel stations could be received nationwide. 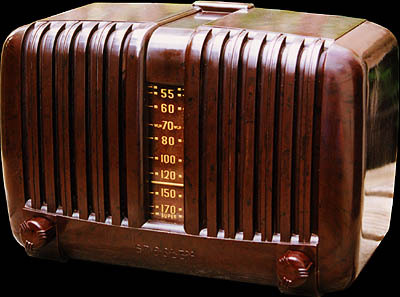 Every purchaser of these Crosley receivers was thus encouraged to listen to the Crosley station. Below the "170" on each dial is the word "Super." I agree. Tube complement: 12A8GT mixer/oscillator, 12SK7 IF, 12SQ7 detector, 50L6GT audio output, 35Z5GT rectifier.